Visitors who come to Skopelos in the summer, to enjoy relaxing on the beaches, go swimming in the turquoise waters of the Aegean and to participate in the traditional Greek life in cafes and tavernas, are likely to notice how green the island is, with it’s extensive pine forest which sweeps down from the summit of Mount Delphi to the edge of the sea. They may not realise, however, that Skopelos has a rich and varied Flora. bushes with flowers like dandelions dipped in sky, a wild lambent blue. 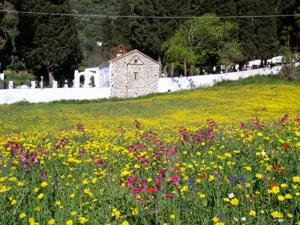 The Wildflowers of Skopelos is for those who love the island of Skopelos and the wildflowers of Greece. There are now over 250 flowers and trees and also information on the island, its floral landscape, geology, climate, and ecological habitats. 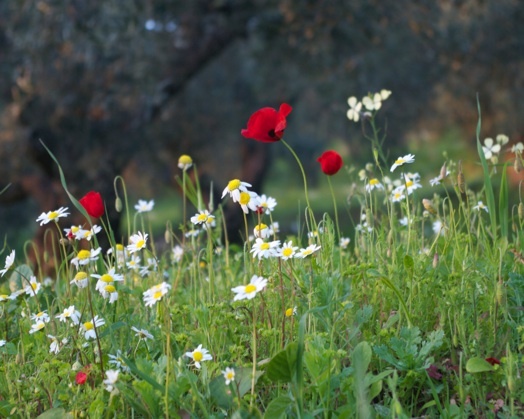 The Wildflowers of Skopelos are arranged by the colours: red, orange & yellow, blue, purple & mauve and white, with a page on trees, which link to the pages of individual flowers. 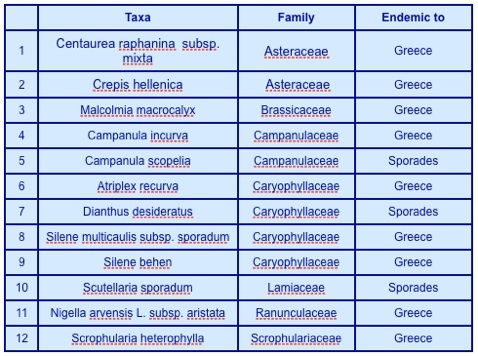 The flower are also included in a pictorial flower index and new flowers which are added at intervals. 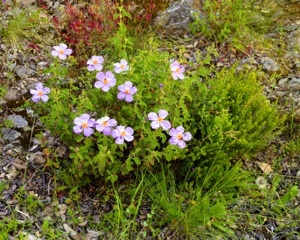 In spring the fields, olive groves and roadsides are filled with the brilliant colours of many beautiful, often interesting and sometimes rare wild flowers; the delicate pink and white rock roses (Cistacea) cover the bushes with flowers, whose petals which look as though they have been made of crinkled tissue paper. The grass is sprinkled with purple gladioli (Gladiolus italicum). These are followed by the by the bright golden yellow of crown daisies and corn marigolds which are later replaced by brilliant red of poppies (Papaver rhoeas and P. dubium). Prickly ivy, Smilax asperans, which is draped over fences and bushes and clambers into the pine trees becomes covered in pale pink fragrant flowers which are followed later by red berries. 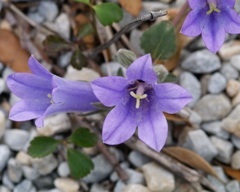 Observant tourists, arriving in early summer, will notice many aromatic herbs most notably sage (Salvia triloba), thyme (Thymbra capitata) and the medicinal herbs Teucrium pollium and St. John’s wort. 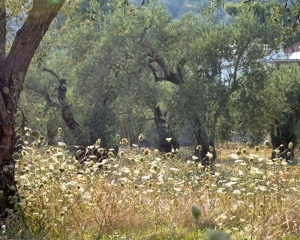 The fields by mid summer are burnished with dried grasses but the flowers of wild carrot (Daucus carrota) appear as a white foam in olive groves and will persist into August providing fodder for animals. Clematis flammula which entwines the wire fences gives off a heady scent from it's creamy white flowers. 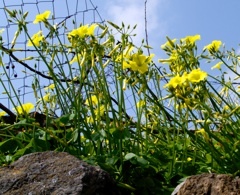 Iridescent blue flowers of chicory brighten the roadsides, reappearing later is summer after a sharp shower. 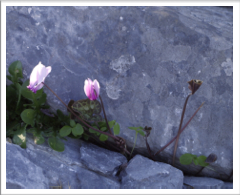 Following the first autumn rains there is a further blossoming of wild flowers with the delicate pink flowers of cyclamen on curving stems, which appear everywhere and even seem to spring from bare rocks. There are golden spikes of the autumn daffodil, Sternbergia; the mauve autumn crocus, colchicum. Purple heather, Erica manipuliflora, in woodland clearings and the tall, white, stately sea squill brighten up the thistly fields. Even in the winter months brilliant flowers bloom; Oxalis pes caprae, which is a native of S. Africa, carpets the ground, throughout the season. The early months of the year see the flowering of many bulbs with narcissi, tulips and grape hyacinths. Then come the irises, white and mauve and deep purple, beginning the cycle again. *John Fowles. The Magus. Jonathan Cape. London. 1966. 1.Rebecca Shaw, director of conservation science in California. Local knowledge. 3.Commission of the European Communities. environment and quality of life. CONSERVATION OF SPECIES OF WILD FLORA AND VERTEBRATE FAUNA THREATENED IN THE COMMUNITY. Volume I. May 1984. 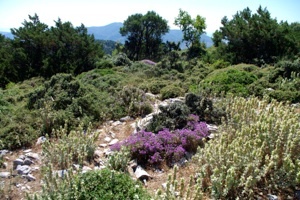 For latest addition to The Wild Flowers of Skopelos go to ...........BLOG.